I have a ton of swatches from my days of custom knitting. From time to time I’ll share one that I think has an interesting story, or just an idea others can use. This will most likely happen on slow crafting days, or slow crafting weeks caused by stitches in my yarn tension control finger. This swatch is from the dark days before the abundance of novelty yarns now available. I often had to mix yarns to get just the right color and texture for a client. One of the easiest ways was to use coned yarn made for weavers. 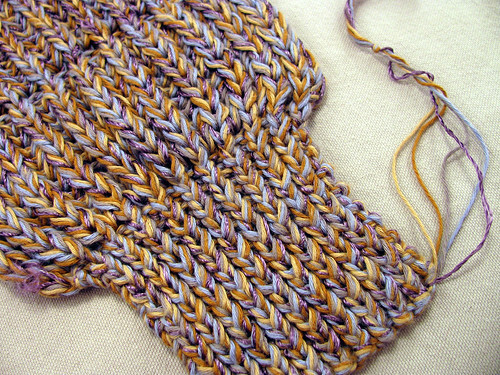 This swatch is from a sweater I knit for a man that wanted something like the sweater Ernest Hemingway wore. The one with the big roll collar. I used the brioche rib for the collar and sleeves and the crossed 1×1 rib for the bottom and cuffs. The front and back were a blue/grey suede that matched the man’s eyes. The photo shows the 4 different colors of cotton I chose and the one strand of purple rayon. The rayon adds just the right amount of shine, and the darkness of the purple adds a little depth to the texture. Mixing yarns can be quite fun and the possibilities are endless. This entry was posted on Monday, January 19th, 2009 at 3:00 am and is filed under Knitting and Yarn. Tagged: Knitting, Thread, Yarn. You can feed this entry. You can leave a response, or trackback from your own site.